There are currently no products in your cart. Yes! We're located in the United States but can ship almost all of our products all over the world. However, a select few items cannot be shipped outside of the USA and they are marked as such. We accept Mastercard, Visa, Discover, and American Express as well as debit cards that have the Visa/Mastercard Logo. We also accept Paypal. If you would like to pay by check or money order, please call us to place your order and we will provide instructions on paying by mail. We want you to be happy with your purchase. If you are dissatisfied with your order for any reason, you have a full 60 days to return it for a refund. Read our return policy for more info about returns and exchanges. How quickly is my order shipped and when should I expect to receive it? Most orders placed by 2pm EST are shipped on the same day from our warehouse in Pennsylvania. Shipping time depends on your shipping method preference at checkout. Orders submitted after 2 PM on Friday will ship out on Monday. On rare occasions, an item may be backordered or out of stock, and you will be notified of any delays. Be sure to enter an accurate email address at checkout so we may contact you if there is a situation concerning your order. US customers will receive an email including order information and a tracking number. You can track your package at USPS.com or UPS.com depending on which service you selected. Note: Tracking numbers may take 24 hours to update information on the previously mentioned websites. Tracking for international packages is only available through International Express Mail. Regular international airmail does not come with tracking. Do you sell your products wholesale? We do offer discounts on large quantities of many of our items. We also offer drop-ship services. Please contact us with your needs and we'll happy to help. Do you have mailing catalogs? At the moment we do not offer paper catalogs. 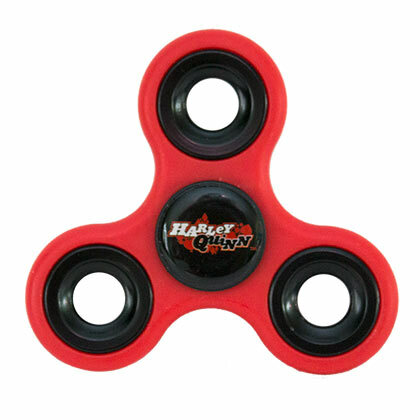 We add products to the site every few days, so a paper catalog would not be able to show our newest merchandise. To receive special offers and updates, please sign up for our email newsletter. 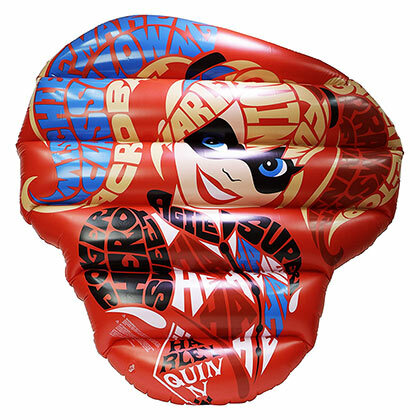 PVC Harley Quinn superhero figurine. 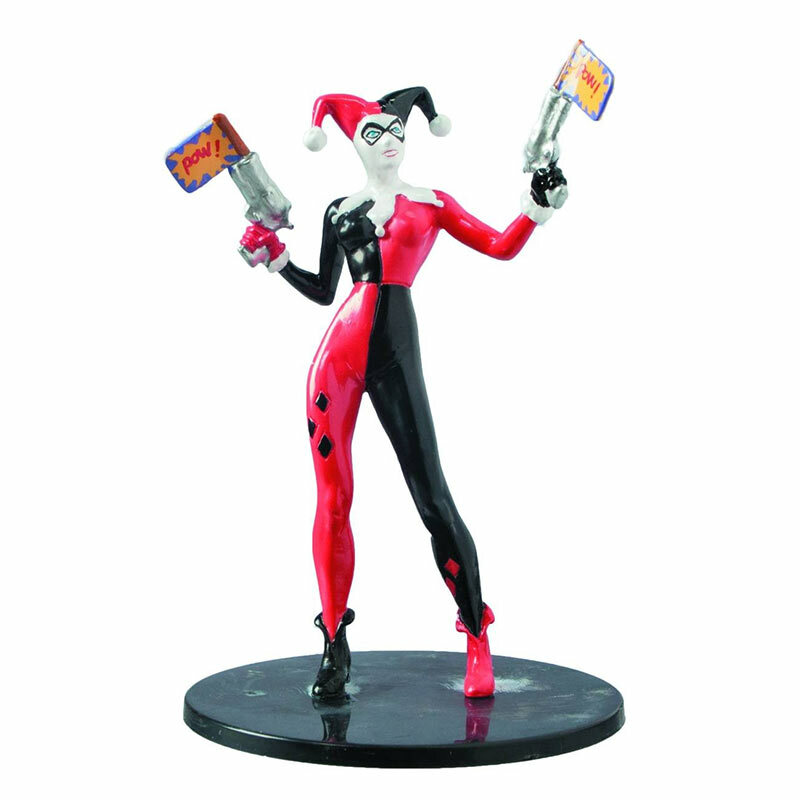 This standing figure depicts the classic Harley Quinn look and stands 4" tall. Officially licensed. 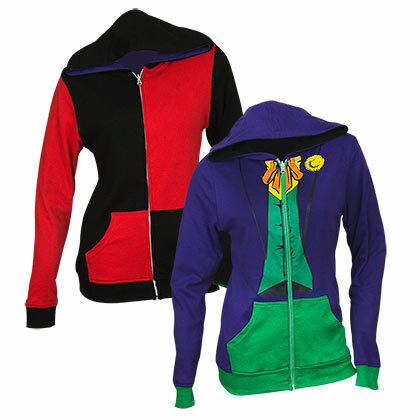 Sizes may vary slightly between manufacturers. Please contact us if you have any questions. Raise your arms slightly and measure around your body. Be sure to measure the fullest part of your chest/bust, keeping the tape parallel to the ground. Measure around your waist where your pants usually fall. Keep one finger between the tape and your body to ensure an accurate fit. 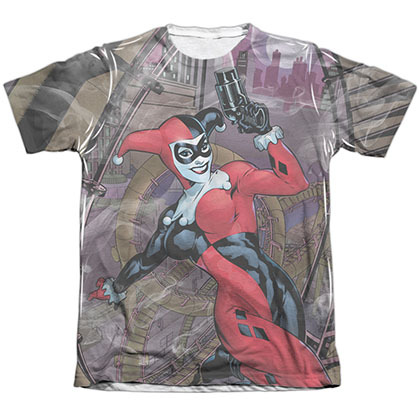 Superheroden.com is owned and operated by Main Merch Inc and is a marketplace for officially licensed superhero apparel and merchandise. 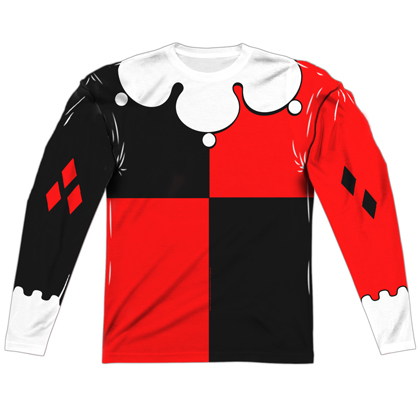 We've been providing official gear including, t-shirts, sweatshirts/hoodies, tank tops, hats, socks, leggings, and more for over 10 years. Buy with the confidence of experience and a no-hassle return policy for up to 60 days after purchase. Receive weekly discounts on selected products and updates about new items.